AGED JUST 35, to say Adam Crozier was a surprise choice to step into the role of Chief Executive at the FA would be understating the case more than a little. The former Saatchi & Saatchi executive was, however, the new broom, the fresh face, the untarnished non-old school tie appointment that the organisation needed. It was 2000 and going into the new millennium, dusty old corridors were well overdue a spring clean. In two years, Crozier shook up the Football Association in a way it hadn’t experienced throughout a history dating back to 1863 – or, for that matter, since. The organisation’s headquarters were moved from Lancaster Gate to more modern facilities at Soho Square. The average age of staff was reduced from over 55 to just 32, the redevelopment of Wembley was progressed, and the FA Council, nominally its controlling body, was reduced from 91 members to a much more manageable 12. Without doubt, though, the most revolutionary of Crozier’s achievements was to appoint the first foreign manager to head up England’s national team. In January 2001, Swedish manager Sven-Göran Eriksson was invited by Crozier to step into the hottest of managerial hot seats. The Swede accepted and the Walls of Jericho came a-tumbling down. At the time, it was an epoch-breaking move. Traditionalists throughout the gam and beyond were aghast at such a development. But, after Glenn Hoddle had opened his mouth and inserted his foot with ne’er a thought for the consequences, a couple of distinctly flat periods of caretaker control by Howard Wilkinson and the earnest but ultimately unsuccessful time of Kevin Keegan, who confessed that he felt himself to be “a little short at this level”, any number of fans were prepared to try something new if it would enhance the national team’s fortunes. With Crozier’s business background, fishing in wider waters in search of the right catch held no fears, and he set his sights on netting Eriksson. As appointments for the England manager’s job go, Eriksson was a certainly no flop. He stayed in post for five years and, in that time, oversaw 67 games, winning 40, drawing 17, and losing a mere 10. He also took England to the last eight in three successive major tournaments; the World Cups of 2002 and 2006, and the European Championships of 2004 in between. Before that less than gracious departure, results – certainly compared to more recent outcomes – suggest that those five years were probably of the highest order since Sir Bobby Robson had England in the last four at Italia 90. So who was this foreign coach that so many England fans, immersed in domestic, and often insular, football had never heard of until Crozier’s headhunting trip took him into continental Europe, and what sort of CV did he have to make him appear to be the right man for the biggest job in English football? In line with so many top managers – witness Arsène Wenger, José Mourhino and Sir Alex Ferguson to some extent – Sven-Göran Eriksson never ripped up any trees during his career on the pitch. He even described himself as a “distinctly average” player. The high point of his career was when he joined Swedish second division side KB Karlskoga FF in 1972, but it quickly became clear to all, including Eriksson himself, that any aspirations of a professional career playing football were well beyond his ability. His time with Karlskoga, however, was hugely influential on how things would develop from there. The club’s player-manager at the time was Tord Grip, whose philosophy on the game had been influenced in large part by the success of Bobby Houghton and a certain Roy Hodgson, and their application of a decidedly English approach to tactics and play, during their time coaching in Sweden. It’s somewhat ironic, therefore, that the initial impetus for Eriksson’s success in management came from English influences, and particular from a coach who would move into the England hot seat that Eriksson would acquire – and then vacate – some years later. Despite being painted as some kind of Euro-centric philosopher of football at the time of his appointment, the Swede was well grounded in the English way of playing. After hanging up his less than worn out boots at the age of 27, Eriksson followed Grip to Degerfors, becoming assistant manager to the man who would later serve long periods in the opposite role. The relationship lasted a year before Grip was given the chance to step up to the assistant manager position of the Sweden national team, opening the door for Eriksson to take his first job in charge of a team. It was a chance for him to put forward his own ideas, developed from his initial Anglosised influences, into action. As if to emphasise his philosophy, he appointed Englishman Tom Chadney as his assistant and set about shaping the team in his image. Taking up the post on the first day of 1977, in just two years he took Degerfors to successive promotion playoffs, the latter of which led to the club’s rise to the Swedish second tier. By anybody’s measure, it had been a remarkably successful period for the fledgeling manager and one that would inevitably attract attention from the bigger clubs in the country. After leaving Degerfors in a far better situation than he had found them, Eriksson succumbed to the siren calls of ambition and moved to IFK Göteborg in January 1979. Degerfors had been a useful steppingstone, but there was only so far any manager could take a club with limited resources. The move was inevitable if Eriksson was to progress his career. Moving up from a team just promoted from the third level of domestic Swedish football to one of the premier clubs in the country would be a big step but one that he took in his stride. Initially, his pragmatic style of football was met with scepticism from the squad at a club that was more used to an expansive playbook. Who was this unknown coach, promoted way ahead of his meagre achievements to come to a club full of international players and declare that he was going to change the style of play? Events elsewhere in Sweden, however, suggested that this approach of play may have merits after all. Using similar tactics, Houghton took Malmö all the way to the final of the European Cup, only to lose to Brian Clough’s Nottingham Forest and a goal from Trevor Francis. If confirmation of Eriksson’s approach and tactics was required, Houghton’s exploits provided the impetus and, as results improved, the manager had the ultimate virtue of success as a persuasive tool. In his first season, Göteborg finished as runners-up in the Allsvenskan and lifted the Swedish Cup for the first time in the club’s history. It’s one of life’s inevitable truisms, though, that football fans are amongst the most demanding of people, and despite the upswing in results, there was disquiet about the playing style utilised to achieve it. Faithful to his early Anglo-Saxon influences, Eriksson was wedded to a fairly rigid 4-4-2 system – and would remain so for much of his managerial career to come – with an emphasis on work-rate and pressing opponents when not in possession of the ball. It was the doctrine he had learnt from the coaching methods of Houghton and Hodgson and promoted by Grip, who would take over at Malmö for a season in 1983 before Hodgson arrived and won five consecutive titles with Di blåe during his formative years as a coach. The approach grated with the team’s previous, cavalier approach to the game, but it was difficult to argue with results. Despite the success, however, average gates at the Ullevi stadium fell on average by 20 percent or so. For many, Eriksson included, it was a strange phenomenon, but one that would do little to persuade the manager to change his style and beliefs. If he kept delivering results, surely the fans would return – and he kept on delivering. In 1980 the club finished third in the league and were runners-up the following year. In 1982, the breakthrough came – and how. During that glorious season, Göteborg were crowned league champions, won the domestic cup and became the first Swedish side to lift a major European trophy. Competing in the UEFA Cup, they progressed to the two-legged final and faced the strong Hamburger SV. A scrappy 1-0 home win suggested that a tough return game in Germany would prove a difficult task, but an exceptional performance, guided by Eriksson’s shrewd tactics, saw them win 3-0 and lift the trophy 4-0 on aggregate. Few would assert that the coach was taking Göteborg in the wrong direction now, but just as the club and its fans came to appreciate him, it was time to move on again. The next step in the coaching ladder awaited and, over the next few years, Eriksson would climb enthusiastically. It was inevitable that all of the major European cubs would by now have taken notice of what Eriksson was achieving in Sweden and would be pondering on his blossoming CV if they had a vacancy. Such was the case at Benfica. The perennial top dogs of Portuguese football were in the market for a new coach, and when offered the chance to move to Lisbon and take charge of one of the continent’s most famous clubs, Eriksson readily grasped the opportunity. It would be an unqualified success. Joining in September 1982, he became an instant hit, leading the club to the 1982/83 Primeira Divisão title, leaving arch-rivals Porto four points behind and Sporting trailing by a further five. For good measure, they completed the domestic double by also lifting the Portuguese Cup, and only lost out in the final of the UEFA Cup to Anderlecht. The following season, Benfica retained the title. It had been a hugely successful time, but as with Degerfors and Göteborg, it was difficult to see where else Eriksson could take the club at the time. To seriously compete with the mega-clubs of Europe would take investment that the club didn’t have. It was time for the next step. Two-year stints were becoming the regular length of tenure for Eriksson as success and an accumulation of trophies opened the door to other opportunities. He was seldom reluctant to reach out for the next challenge. Now, with his credentials stamped at a major European club, one of the big leagues of the continent would seem to be the next step. The opportunity, when it came, was to work in Serie A with Roma. If the Swede’s time in Lisbon was marked with instant success, despite all roads leading to Rome, there was no such joy in the early periods with i Giallorossi. Serie A has a distinctive culture, and despite having a CV with a few league titles and European successes, changing an ingrained belief in the way the game should be played was never going to be an easy task. Eriksson’s first season in the Eternal City must have felt interminable, especially at the start, as it took Roma until the ninth league game of the season to register their first win. Strangely, given the volatile nature of managerial positions, the club hierarchy kept faith with Eriksson. 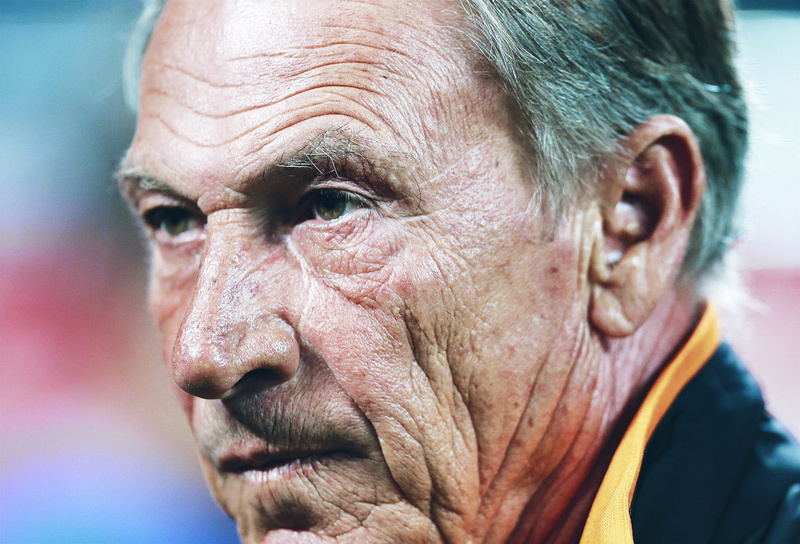 The coach persisted and although it remained a struggle, by the end of the season, Roma were up to seventh place. It was a minor success for the man charged with raising the fortunes of the club to the sort of levels they considered to be theirs by right. Nevertheless, the true value of that first season would be revealed in the following period. With coach and squad now acclimatised to each other, the Giallorossi bloomed in the manner of Eriksson’s other charges. 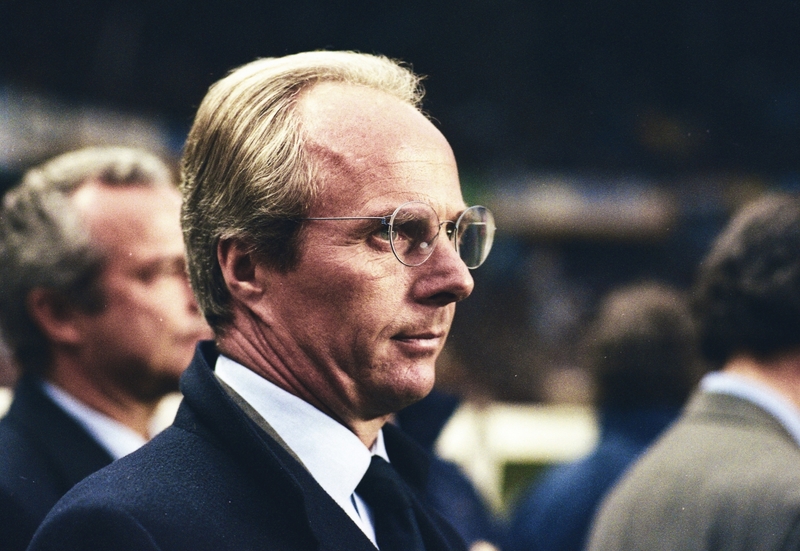 The 1985/86 season would hint at both the strength and weaknesses of Sven-Göran Eriksson. It has to be said that, despite their less than outstanding form both before Eriksson’s arrival and in the previous recent seasons before it, Roma had a more than decent squad of players. A midfield that could boast the talents Carlo Ancelotti, Toninho, Zbigniew Boniek and Giuseppe Gianinni should not have been struggling, and in Roberto Pruzzo – who would score more than a century of goals in just 240 Serie A games across his career with the club – they had a proven goalscorer. In this season, as the players adapted to Eriksson’s promptings, things began to click. The midfield was producing chances and Pruzzo would convert with alacrity as he became the Serie A Capocannoniere and top scorer in the Coppa Italia that season. As the season came to a climax, it even looked as if Eriksson could top all of his previous achievements and take both the Scudetto and Coppa Italia back to the Olimpico and the long-suffering tifosi on the Curva Nord. It seemed that everything was in place when Eriksson’s charges tore asunder a Juventus team that seemed to be their closed challengers, dismissing the Old Lady of Turin 3-0. All that was needed now was the final push, the cold steely determination to grab the top prize; to display a winner’s pedigree. As would be the case a number of times in the future, though, at that vital moment, the one that separates the winners from the merely exceptional, for whatever reason, Eriksson’s team faltered. A shock 3-2 defeat to lowly Lecce opened the door, and Roma’s title hopes were whisked away. There was the compensation of a Coppa Italia victory over Sampdoria to soften the blow but, despite that, it felt like a lost opportunity, and one that may not reappear for a while. It would have been folly to dismiss Eriksson on the strength of such a near miss of the top prize, but there was still a doubt, perhaps heightened by the title slipping through his fingers, that at the highest level, he may be ‘a little short’ to borrow Keegan’s phrase. A bright opening to the following season that would lead to the ultimate prize this time was required. It didn’t happen, and despite all of the progress he had made with the club, to no-one’s great surprise, he was dismissed in May 1987. It was the first time Eriksson had left a club other than on his own terms. Many would later argue that the Swede’s time with Roma was very much both a microcosm and summary of his managerial career. An ability to take a squad so far, to develop and influence, but when on the cusp of delivering the big prize, there was a tendency to fall short. To some, it seemed that Serie A had found Eriksson out. It was an itch, however, that he would return to scratch. A move to Fiorentina was not the answer and, after a brief and trophyless period with La Viola, he took the opportunity to return to the more tranquil and welcoming waters of the Portuguese league and a homecoming to Benfica in 1989. In more familiar surroundings, and back at a club where belief in his abilities had been demonstrably proved, he again flourished. He would stay in Lisbon for three years, again delivering silverware with the title in 1991. The previous year, though, again led to nods of acknowledgements by his naysayers. The Eagles swooped on relatively easy prey through to the semi-finals of the European Cup, disposing of Norwegian club Fram, Honvéd and Dnipro, netting no less than 19 goals and maintaining six clean sheets. Victory in the last four on away goals against Marseille saw Benfica to a final against Arrigo Sacchi’s AC Milan. 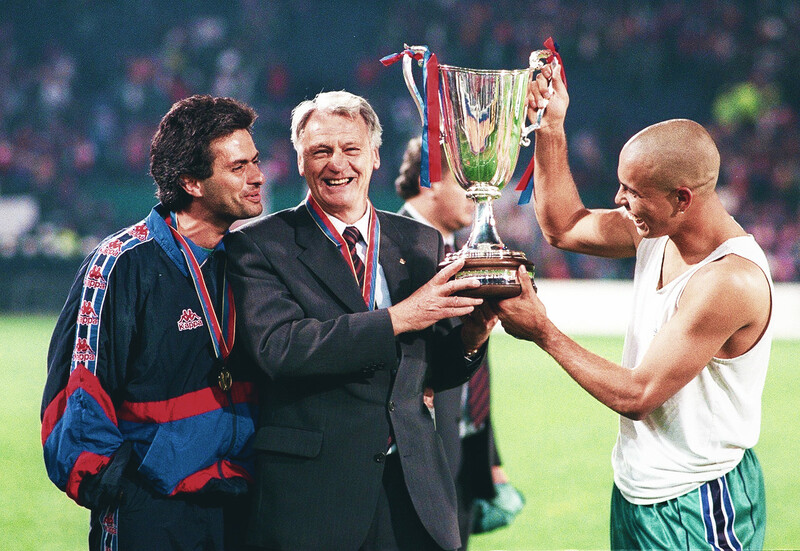 A single goal from Frank Rijkaard as the game entered its final quarter was enough to take the trophy back to the San Siro. Benfica were runners-up. Some would say it was a good run to the final; others would argue that Benfica had been fortunate, having only faced one difficult opponent, whereas the Rossoneri had needed to overcome both Real Madrid and Bayern Munich to reach the final. Of course, the counter-argument is that you can only beat who you are up against, and Benfica did that with ruthless efficiency. Had Eriksson excelled or fallen short at the last hurdle again? In July 1992, he had the opportunity to scratch that Serie A itch once again, and he moved to Genoa to take over at Sampdoria. His five year tenure was comfortably the longest in his managerial career to date, but despite a vigorous and enthusiastic ownership, Samp were not one of the giants of Italian football, and expectations were less grand than they had been with Roma. A Coppa Italia victory in 1994 was an acceptable return. In June 1997, Eriksson shed the comfortable blanket of Genoa to jump back into the Colosseum and returned to Rome, but this time not to Roma. 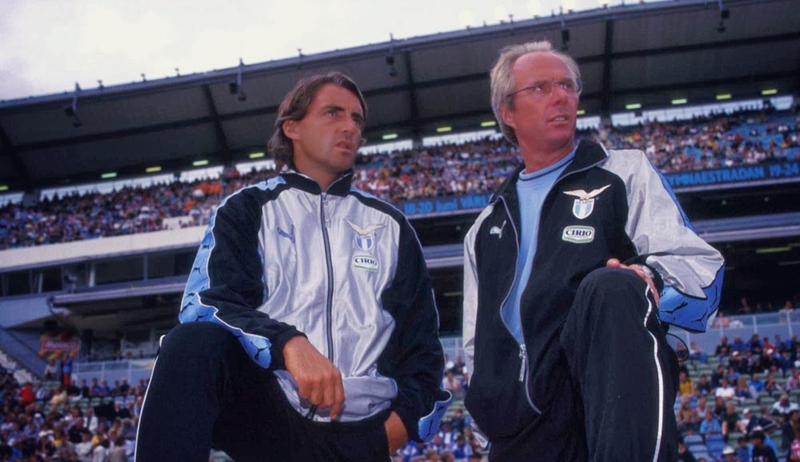 Eriksson moved into the manager’s chair at Lazio. 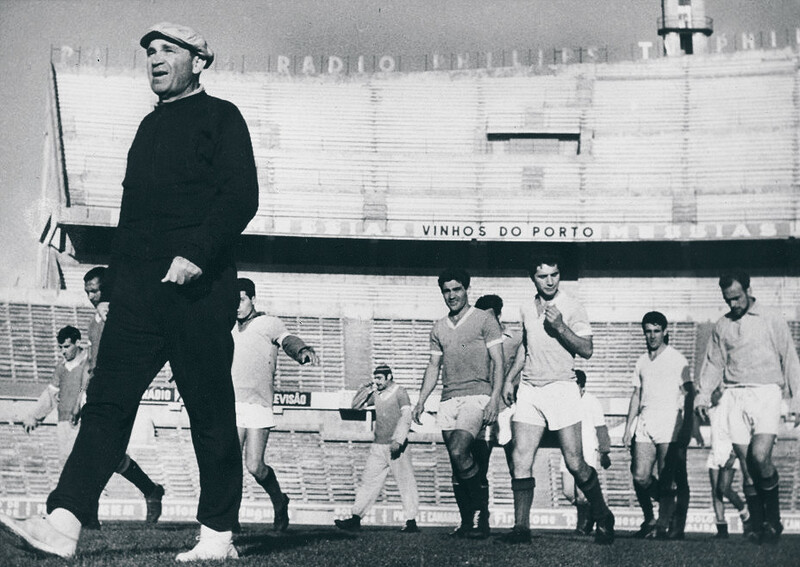 Having managed Roma, taking over at their fierce cross-city rivals was both a brave and challenging proposition. If he could deliver there what he had failed to do for their eternal rivals, he could both get the monkey of failing at the highest level off his back and complete his CV. Displaying the sort of singleminded ambitious streak that had seen him move so many times before, Eriksson reportedly went back on his word to take over at Blackburn Rovers when the Lazio opportunity presented itself – ironically the job went to Roy Hodgson instead – although he officially cited family reasons as the deciding factor. As prospective jobs go, and as the fates transpired, it would be difficult to describe it as a poor decision. Now with Tord Grip as his assistant, Eriksson began the task of proving himself in Italy and showing Roma the error of their ways when they dismissed him. In his four years with Lazio, he would do just that. In 1998 he won the Coppa Italia and the Italian Super Cup. The following year, he took Lazio to the final of the last Cup Winners’ Cup. In what was a less than promising start to the tournament, only the away goals rule saw them edge past Swiss side Lausanne, before a 2-3 away victory in Belgrade eliminated Partizan after a sterile goalless draw in Rome. It was a couple of uninspired performances to get them to them into the last eight, but Eriksson had got his team over the line each time. The quarter-final tie paired the Italians with Greek side Panionios and they cantered to comfortable seven-goal aggregate win. Now it was the last four. If he could take Lazio all the way, perhaps it would set them up for a concerted tilt at the title the following season. As the club had only held the Scudetto once in their existence, such a prize would dispel any doubts about the Swede’s managerial ability. There was still the Cup Winners’ Cup to play for first, though. In the semi-final, an equaliser from Croat striker Alen Bokšić against Lokomotiv in Moscow 13 minutes from the end was sufficient for a place in the final as again Lazio played out a goalless draw at home, and went through courtesy of their away goal. The final, against Mallorca, was played at Villa Park in Birmingham, and after Christian Vieri gave Lazio the lead after just seven minutes, it looked like Eriksson’s team was on the way. Just four minutes later, though, Dani equalised for the Spanish island club and a tense battle remained in the balance until inside the last 10 minutes, when the influential Czech midfielder, Pavel Nedvěd, netted the winner. It seems slightly contradictory to say, but the way Lazio had been forced to battle through some tight games to get to the final and lift the trophy may well have been a more worthy achievement – and also more valuable – than when Benfica skated through the European Cup run only to fall at the final hurdle. Eriksson’s side had become case-hardened and now knew they had the battling ability to get the job done. It would serve them well during the following season. I Biancocelesti had previously only been champions of Italy on one previous occasion, back in 1974, but if Eriksson’s team of undoubted talent could now carry forward the winning mentality of the previous season, he could deliver the ultimate in Italian domestic football to the Curva Sud, whilst the Roma fans, behind the opposite goal, would be left contemplating what might have been. Despite a series of much-improved performances, it seemed that the Scudetto would again escape the clutches of Lazio and their eager manager. With just eight games to play, Juventus were skipping towards the title, no less than nine points clear of Lazio with just 24 to play for. The Roman club kept chasing, though, and, incredibly, Juve cracked. Defeats to AC Milan, Verona and then to Lazio in a frenzied Stadio delle Alpi exposed the Turin’s team’s vulnerability, and Lazio’s now well-honed ability to get the job done allowed them to close the gap. In the last eight games, they won seven and recorded a single draw. It meant a last day denouement. Going into the final games, it was still in Juve’s hands, as they held a two-point lead over Eriksson’s team. At the Olimpico, Lazio did all they could, thumping Regina 3-0. Everything now depended on Juventus, and their game away to little Perugia. The Umbrian weather had been decidedly inclement, however, and on a flooded pitch, Juve’s title hopes washed away. They lost 1-0, and Lazio’s chase bore fruit. Their determination to press on remorselessly when the title had seemed lost had paid off. The Scudetto, absent for 26 years, returned to the light blue side of the Italian capital. Eriksson had delivered the title by a single point. There are any number of types of victory. Winning at a canter can be carefree, but to do the unexpected, to pick the pockets of the aristocracy when they think all is home and hosed, just because you refuse to give up, is surely the sweeter feeling. For Sven-Göran Eriksson, that elation must have come in spades. Not only had he proved his detractors wrong, he had done so with the cross-city rivals of the club that had dismissed him the year after coming so close to the title. His CV was now complete, and when Adam Crozier came knocking, it was time for the next rung on the ladder. This article is about the time before Sven-Göran Eriksson joined England’s and is intended to paint a picture of the manager’s achievements that led to his appointment. It would be injudicious, however, not to point out that, although in major tournaments England lost out three times in the quarter-finals, two of those occasions were on penalties, and in the other, David Seaman was inexplicably conned by what – despite protestations from Ronaldinho to the contrary – was surely a mishit free-kick. Were any of those eliminations down to poor management? The answer each person gives to that question will probably illustrate their opinions on Eriksson’s reign with England, whether it represented a positive or negative entry on the CV of the nation’s first foreign manager. Having reviewed his CV up to the time of appointment, perhaps even the most ardent advocate of having an English manager lead the national team would concede that Sven-Göran Eriksson had the credentials for the job and that he was surely once one of Europe’s best.